At Nicole’s yearly evaluation, her manager said she thought Nicole was ready to be a preceptor for new graduate nurses. Nicole was completely surprised. She had been a nurse for only two years and didn’t feel ready. But according to her manager, the charge nurses had recommended her for the role. Others saw her potential. It was true that on clinical days, when Nicole watched the nursing students nervously take vital signs or cluster around their instructor, she realized how far she’d come since her new own grad days. Nicole agreed to try and signed up for the next preceptor training class. She learned some good tips. Over time many nurses learn to take short cuts and may drift from best practice. As a preceptor, take a self-inventory of your nursing practice. It’s important that your practice align with policy. It may be as small as not carrying multiple saline flushes in your pocket, but as a role model, it’s important that you uphold evidence-based practice as well as regulatory guidelines. Point your preceptee to policies and procedures. Be a continual learner yourself. Let your new grad orientee know that learning is a lifelong practice. Lead by example and demonstrate professional communication skills with colleagues and providers. Communication is a core competency for nurses and your new grad orientee will mirror your behavior. A new grad nurse orientee has just been schooled in the latest practice and may even be able to teach you a thing or two. Listen respectfully and thank them for the information. The new grad you are teaching is a colleague and will soon be the person you trade shifts with! Make sure you stay with your new grad orientee during breaks and lunch times. Introduce them to your colleagues and manage them up. Teach your new grad the group norms. If the manager’s door is closed, does that mean Do Not Disturb? Likewise, if Ashley has the long-standing title of making the best salsa on the unit, perhaps your orientee might want to bring something else to the potluck. Patient safety is always prioritized first. Let the new grad learn by mistakes when possible as this is a very effective way to learn. An example is encouraging her to see that the IV roller clamp on an antibiotic was left clamped rather than rushing to fix it yourself. Do remember millennial are computer savvy, self-directed and want regular feedback. Do be specific, concrete and concise. Don’t bury a critique in an overly long explanation. Do ask “How do you think that went” or “How do you think you did?” to encourage self-reflection. Don’t just have your new grad orientee watch you. Remember that passively observing you practice does not promote critical thinking. Don’t provide negative feedback in front of others- find a private space. Do try to provide feedback in real time- unless you are angry or upset, then give yourself time to cool off. Don’t lead with “you” as in “You missed a step”. Do provide feedback on one behavior at a time rather than trying to change or address multiple behaviors at a time. In Benner’s stages of clinical competence, the novice nurse requires continual verbal and physical cues and does not have situational awareness. The novice nurse is preoccupied in learning tasks and cannot yet see the big picture. At this stage, a nurse knows the difference between normal and abnormal textbook values but cannot recognize nuances in condition. Preceptors should also understand “reality shock” described by Kramer (1974). 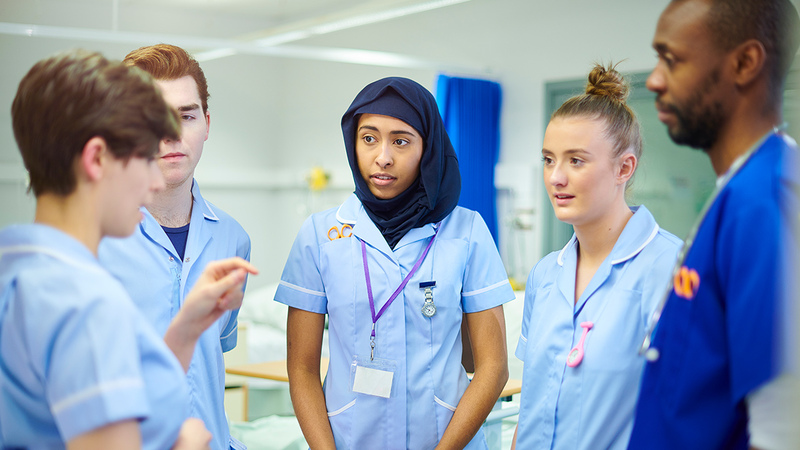 Reality shock is the process that newly graduated nurses undergo as they transition from school to the work setting, and realize they are unprepared. Preceptors should be familiar with each phase. New grad orientees need help managing the conflict of role expectations and reality. Orientees unable to resolve the shock phase area at risk for leaving the organization. Remember that everyone was new at some point. Your new grad orientee will thank you for your patience and encouragement. You may have to repeat something several times. When you are patient and non-judgmental, you create a safe learning environment. Being a supportive preceptor and actively helping to develop a new nurse is a very rewarding role.